The basic shape of the body. 1: A guideline from top to bottom. 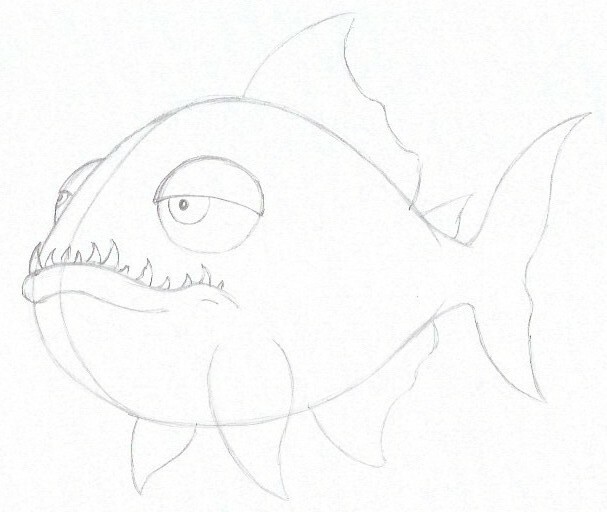 I want to draw my piranha viewed from the front and side. Drawing a line like this, helps me to identify the middle of the body. Guidelines are immensely helpful in keeping the right perspective, which is super important in order to get a 3D feel of your drawing. 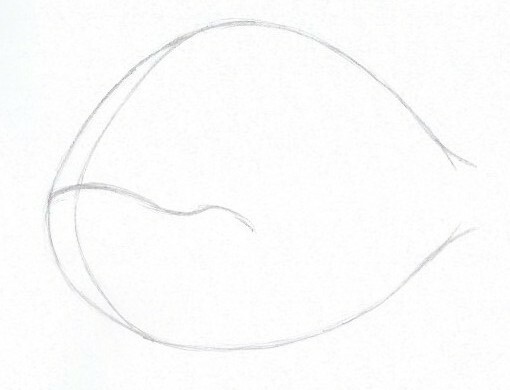 2: The basic shape of the mouth. 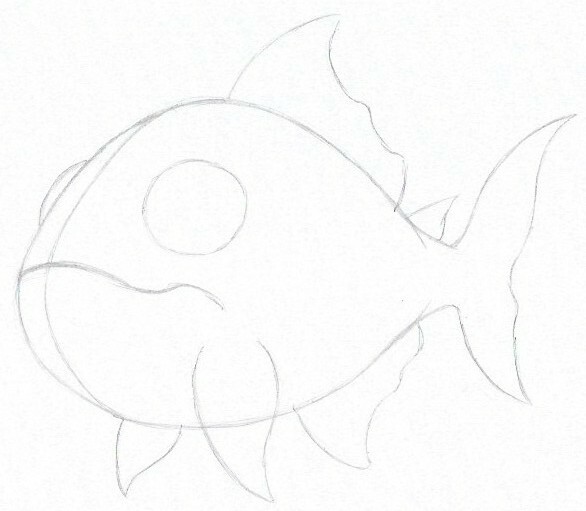 Using the guideline from before, I can place the mouth, so that the top of the curve is right on the mid line of my fish. 3: The beginning of the tale. Coming of the back end of the body. Again I’m starting with the basic shapes, details will come later. The last two fins. The pectoral fins. 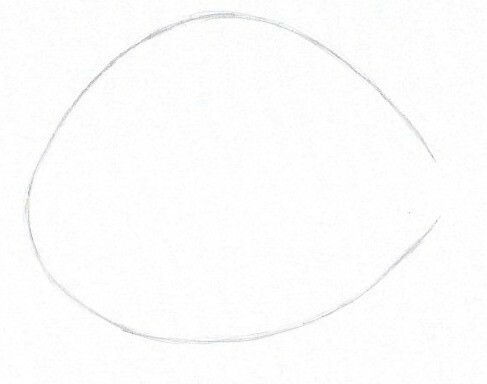 Also, the basic shape of the eyes. Here I am also very much using the guideline, that separates the body in half. This allows me to place the far eye in the right place, to get a convincing 3D effect. Lower Lip, teeth, eyelids, pupils. 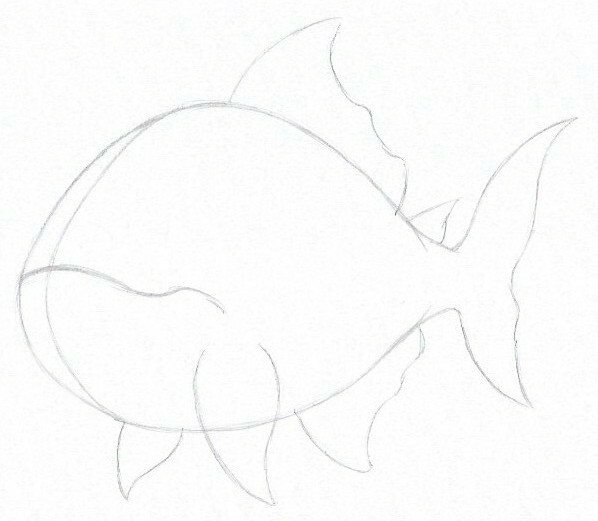 Erasing some of the guidelines, and adding structural lines in the fins. On the fins, I am adding some cuts and irregularities. This gives him some battle scars, and some personality. 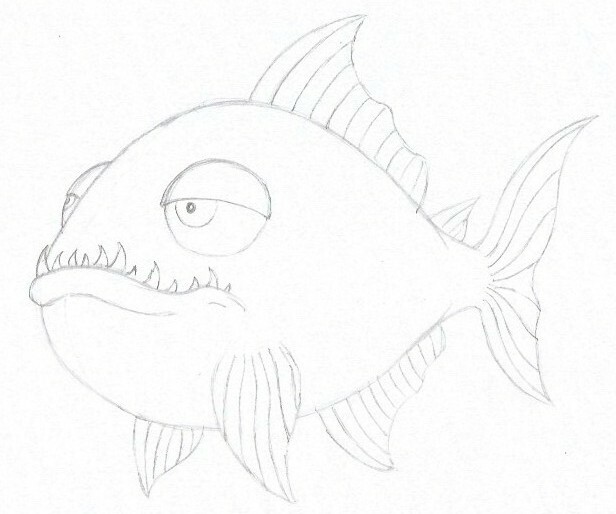 Also, gills, lines under the eyes, and some scales. Outlining in ink. I used a fine liner for this. 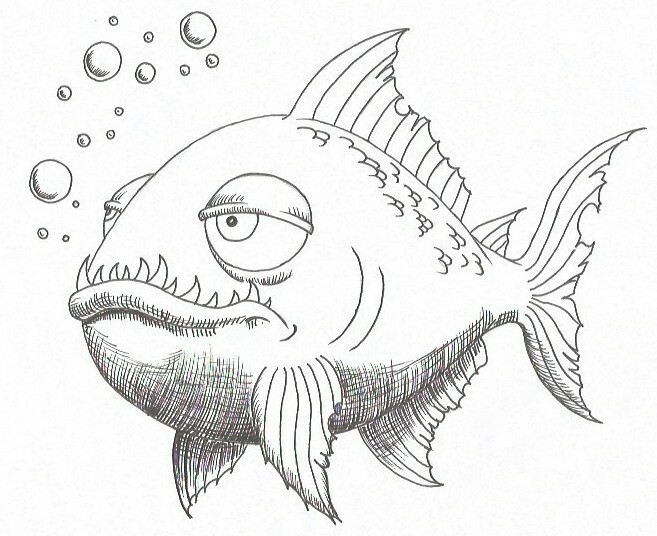 Again, done with a fine liner, and using basic crosshatching. 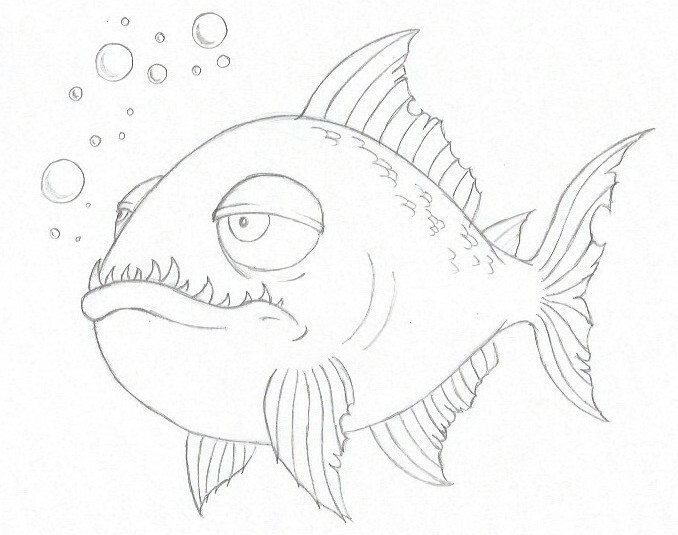 I am trying to keep the lines going with the shape of the fish, to underline the 3D effect. I used two shades of blue, a Grey, a red and an orange. 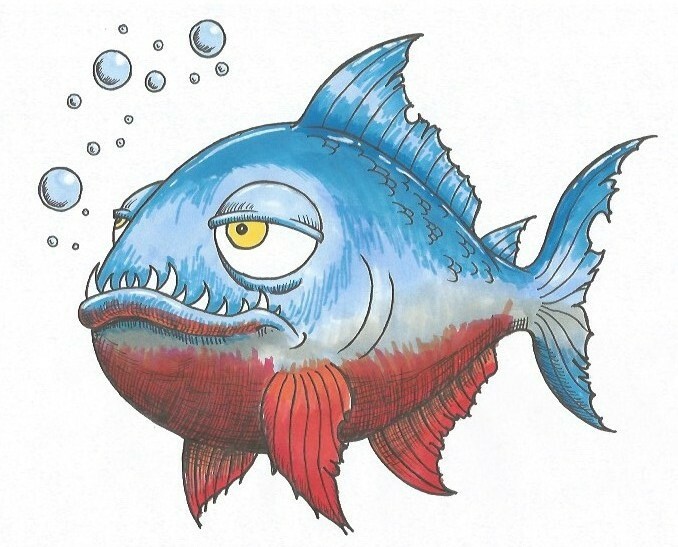 And then I used a white posca for some highlights along the back and fins. If you look closely, it’s fairly easy to see where the different colours go. The challenging part is making them blend into each other relatively smoothly. And here we are, at the end. 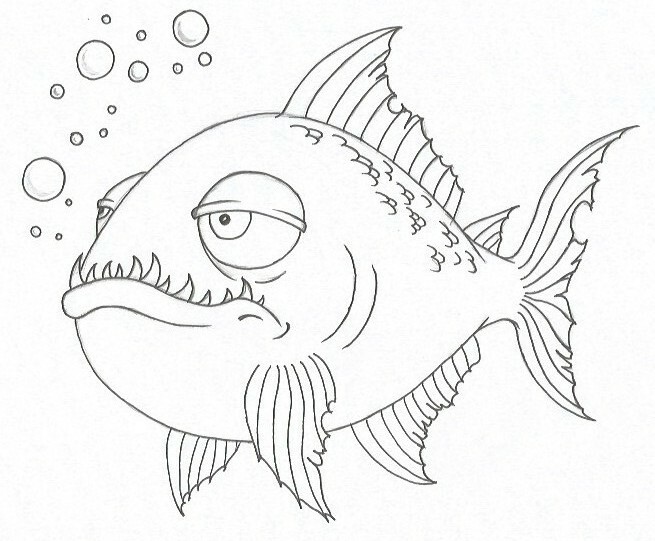 This is my take on how to draw a piranha. I hope this made sense to you, and that you learned something from it. If you try it out, I’d love to see the result, or just hear a bit about your experience with the lesson. So please comment below, I’d love to hear from you! And remember: Drawing is s skill – let’s learn it! That was such a great tutorial. Thanks so much. Thanks again, I’ll be coming back for more. Thank you for your article! It’s fantastic that nowadays we don’t need to leave our home to learn something but are offered good tutorials – like yours – online. I’m glad to hear that you’ll also add some lessons on colouring! I’m generally amazed by the great variety of colours, of course having my favourite ones! By the way do you think that anybody can learn drawing? Or special skills are needed? Thank you again for your post! Yes, it truly is amazing how much we’re able to learn with just simple online search. Literally anything is available, right?!? And yes, I’ll be adding some lessons on colouring, but like I mentioned it’s a big subject in itself, and ultimately it comes down to ones own preference, like yours.